What will it take to get people to stop texting and driving? Volkswagen and the Cape Town, South Africa branch of global ad agency Ogilvy & Mather designed a print ad that is designed to look like a trio of text messages. For example, one says "I'm in Tr..." and gives you a choice of selecting traffic, or trauma. A second one reads, "See you n..." with the choices being now, or never. Perhaps the most thought provoking one reads, " I'll be there in a wh..." with the two possible words being while or wheelchair. Texting while driving remains a huge problem. On July 1st, Florida started enforcing a law that prevents truckers from driving and texting while a law against non-commercial drivers will take effect on October 1st. The truckers will face a $500 penalty for the first infraction and their company will be hit with a $2750 fine. By the third violation, the driver's fine would be up to $2750 with a 120 day license suspension. The trucking company could be hit with $11,000 in fines. Hitting drivers where it hits them the hardest, in the wallet or pocketbook, might be the only way to get them to stop texting and driving. 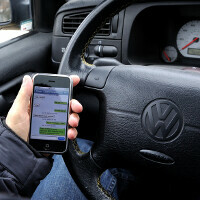 Including Florida, 39 states and D.C. have enacted laws against texting and driving. 3 other states do not allow you to text and drive if you are under 21 or are using a learner's permit. Studies show that those who are reading or sending a text or email message are 23 more times likely to be involved in a crash than those who wait to reach their destination to send a message. Back in May, we told you that the nation's top four carriers were aligning themselves behind AT&T's "It can wait" slogan. Interesting idea. I hope it's at least a little effective. Some people will never listen though. Good on VW, I do my best to not text and drive. But I catch myself once in a while. Clever ads. Ineffective solution. These efforts will work when people also learn to stop speeding. Texting while driving is really not an advisable tip. As much as possible, we should avoid this doing because these may cause accident. It is a prone to accident habit. So far, police in a number of states have not been able to find too many people who are texting while driving though many are still likely doing the work. To help stop the harmful practice, the Department of Transportation has granted a $550,000 grant to discover better ways of catching it. A personalmoneynetwork.com/cash-advance can help you pay for your ticket.